Each delivers a luxury experience. My listings are alphabetical. On Chief's Island. 12 tents. On an island. 8 tents. On Xaxaba Island. 12 tents. On private island Mombo. 9 tents. Borders Moremi Game Resv. 9 tents. Virtually all safari lodges and camps in the Okavango Delta and other Botswana areas are upmarket, by design. The Botswana government desires to preserve and protect its vulnerable wildlife environments. At the same, it needs to maximize long-term safari tourism income for the benefit of its citizens. The government is limiting tourism lodges and camps mainly to those geared for upscale tourists (Bhutan also uses this approach). 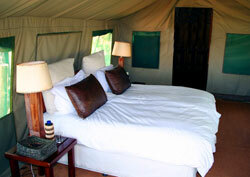 Nearly all the lodges and camps in Botswana are high quality with correspondingly high rates.